Eva spoke to Jezebel about Kandi’s shadiness toward Porsha Williams. She remarked, “I don’t feel like she has to be supportive, but she also doesn’t have to be a hater.” Eva also feels that Kandi has thrown plenty of shade her way, as well. The model is still upset about a misunderstanding with Kandi that arose when Eva made a comment about Shamea Morton’s skin tone. Kandi, who is close friends with Shamea, was angry, and Eva later denied that she was commenting on Shamea’s skin tone. Eva’s pick for who should hold a peach again? Surprisingly enough, it is none other than Phaedra Parks. Eva said, “The Phaedra I know and the Phaedra that the world knows can be two different Phaedra sometimes. So, I would like to see her back on the show.” That would be a catastrophic an interesting idea. Plus, we all know who doesn’t want Phaedra back on the show: Kandi, of course. 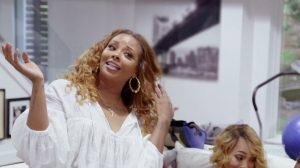 TELL US- IS EVA MARCILLE SHADIER THAN KANDI BURRUSS? WOULD YOU LIKE TO SEE PHAEDRA PARKS BACK ON THE SHOW?